The Million Dollar View! Smith Mountain Lake! 3 bedrooms, 3 full bathrooms. This is a great place for Family Reunions. Bernard's Landing is unique because it is at the end of a state road, and all of it is a Peninsula, located at the widest part of the lake. 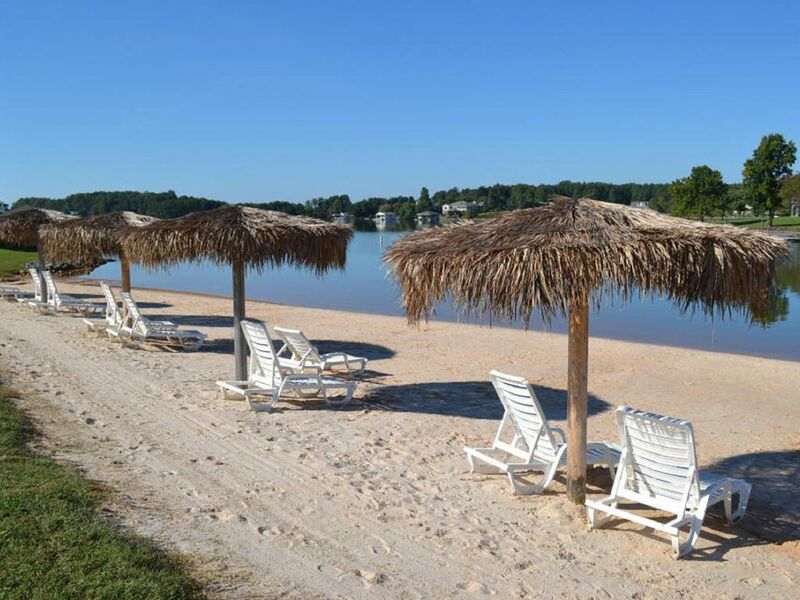 The view is a wide expanse of sparkling water with the backdrop of the seven mile long Smith Mountain. The king bedroom on the main level also has a small table and chairs. There is a king and twin bed in the loft. The lake level has 2 sets of bunk beds and a pull out sofa. It has an over sized deck and screened in porch. There are also 'water toys' available for families that choose this home for their lake vacation. Located right across the from the Clubhouse with a large pool, baby pool, indoor pool, basketball court, racquetball, pickleball and tennis courts. It is an easy walk to the beach. Your dock is also just steps away if you want to bring a boat or rent one. There is a place to launch your boat here. There is a restaurant/bar and Bernies Store on site for afternoon ice cream and shopping. Family Get Togethers! : There are other rental homes nearby if you need more space, or you are planning a family renunion. Located at R-11 on the Smith Mountain Lake Map. Near shopping and entertainment for the kids and adults! We just returned from our family vacation at Bernard's Landing and can't wait to go back! The manager, Carol assisted us with booking our trip and went above and beyond the whole week. From the moment we arrived we felt welcome. Our townhouse was spacious and very clean with an amazing view. Our four children had so much fun tubing, jet skiing, and fishing for the first time. We had a great time relaxing while overlooking the beautiful lake. We enjoyed a day of hiking and swimming at Smith Mountain. We even were invited to trivia night and enjoyed the friendly families who live and vacation here. We took a boat ride to Bridgewater where we had dinner and played mini golf before returning to the marina. Our 4 teenagers told us it was their favorite vacation! We can't thank Carol and her husband for their wonderful hospitality. We loved having you here. It is a great place for a family vacation. Hope to see you again. You were a wonderful family to have here and thank you for leaving our vacation home so nice! Great location. End unit has side door for easy access to the docks. The kids enjoyed hanging out on the docks, fishing, swimming and meeting new friends. Bernard's Landing has two pools and 6 tennis courts which we used often and enjoyed. Great community to run or walk with views of the water everywhere you turn! It is a condo so there are people above and below this unit. But they were only there on the weekends so it was quiet during the week. The condo is a perfect size for a family of 4 or 5. The neighbors across the hall (who are the rental company) showed us what southern hospitality means! We felt at home from the minute we arrived. If you plan on boating most of the time you are here, this is a great location. Bernard's Landing is about a 15 minute drive or 20 minute boat ride to Bridgewater Plaza which seems to be the main attraction of this part of the lake.The pizza place at Bridgewater Plaza is awful. The pizza is always burnt. That is the way they make it. We heard other tables complaining about it while we were eating there! Joe's pizza has a pretty good dinner buffet. The Crazy Horse (restaurant is called Mexico Viejo) was pretty good Mexican food. The best meal we had while we were there was at the Tuscan Tavern. Excellent Itlaian food. It is a small place so the wait was kind of long. For groceries, I preferred the Kroger over the Food Lion. Better produce, cleaner, more selection. And lastly I need to mention Blackwater Boat Company. It is located right next to Bridgewater Marina. My husband accidentally turned into Blackwater when he was going to Bridgewater Marina. It turned out to be less expensive. It is smaller, though, so there are less boats to choose from. The boat we were renting was broken. Max and the whole crew there bent over backwards to get it fixed and make us happy. Specifically, to make our daughter happy so she could be on the boat for her birthday! Great relaxing vacation in a beautiful setting! Spring No Pets for Rental homes at Bernards. No smoking.Must remove trash upon departure. Towels and linens are not provided unless requested. All guests may use the amenities at Bernard's Landing with an access card.